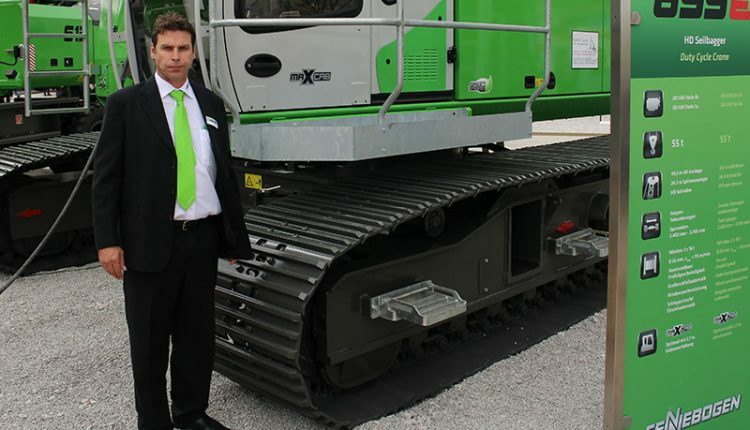 Anthony Heeks, Managing Director of Pace Cranes (P.A. Construction Equipment) Australian & New Zealand distributor for Maeda Mini Cranes, Sennebogen Cranes, Valla Cranes and Shuttlelift Gantry Cranes on the East coast of Australia. Anthony Heeks: Evolution!……The way that the technology has advanced and developed over the years always amazes me. I think it cannot progress much further, then the manufacturer’s release new innovative designs which are constantly improving. The strength and weight of today’s materials and components have enabled certain types of cranes to become larger in capacity whilst being relative compact in size. Not only the size of today’s larger cranes but the development of small mini crawler cranes is also very impressive. Anthony Heeks: My father was the Marketing Manager for Favco cranes in Australia and state Manager for Tutt Bryant Group who were the Australian distributor for Coles, Grove & Manitowoc cranes in the 1980’s. I use to go to work with him in school holidays and enjoyed being around the large cranes and equipment. He then decided to start his own business (Pace Cranes) in 1987 in which I joined 6 months later as an Apprentice Mechanic. We predominately imported used rough terrain cranes from Japan and carried out crane repairs & maintenance. My Grandfather also operated dragline cranes in the coal mines in the UK in the late 1940’s & 50’s..
Cranesy: What’s your favorite memory about your work with cranes? Anthony Heeks: I would have to say my favorite memories are traveling the world with my father and sharing great experiences. Most people wouldn’t have this opportunity but being a family business we have been very fortunate. Anthony Heeks: Our business represents crane manufacturers from Europe, Japan & USA. This has enabled me to travel the world and witness many cultures and meet many people. I have developed strong friendships over the years with many people who share a similar passion. Travelling overseas has had a big impact on my life. Anthony Heeks: There are always new challenges to face. What works today will not necessary work tomorrow. With constant change we have to be ready to adapt otherwise we will be left behind. Cranesy: Safety in workplace. Would you give some essential advices about how to protect yourself from potential injury? Anthony Heeks: With operating a business in a high risk environment it is crucial to ensure our business not only has the appropriate safety practices and policies in place but they are being followed. Staff training is essential to ensure equipment is being used as per manufacture’s recommendations and to ensure staff are aware of all of the risk involved. The current equipment available is relatively safe if used as recommended but there are many other factors which affect the safety of this equipment. We find many people have the correct license applicable to operate certain equipment but have not had familiarized training or the experience to operate safely. Anthony Heeks: Most certainly. My company has an apprentice program in place and has employed many young people over the years. I have seen many people continue their growth in the local industry and have become quite successful in their ventures. Anthony Heeks: Happiness to me is being able to evenly balance my career with my personal life. I have a passion for many sports especially motorcycle racing. (It also helps that I have a very understanding wife who allows me to enjoy both). My wife and family & successful business = Happiness.